The latest, winglet-equipped, version of Russia’s Sukhoi Superjet 100 (SSJ100) regional jetliner made its international debut at Singapore Airshow on February 6. 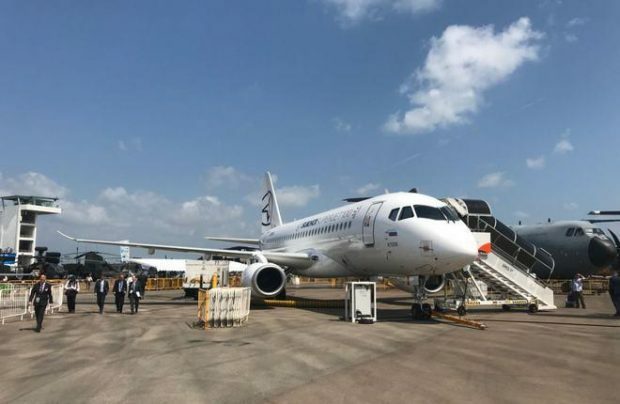 The manufacturer, Sukhoi Civil Aircraft Company (SCAC), is showcasing an SSJ 100LR prototype (97006), which was the first one to start flight tests with the winglets on. The winglets are dubbed saberlets for their saber-like shape. According to the airframer, the aerodynamic enhancement shaves at least 3% off the fuel burn and improves the airliner’s runway performance. “Introducing winglets, which is a part of the aircraft upgrade program, will help operators save up to 5 million rubles [$87,500] per airframe,” SCC President Alexander Rubtsov commented earlier. The upgrade program is aimed at helping SSJ100 compete against similarly sized aircraft, such as the Embraer E-Jets E2 and the Bombardier CSeries. Last year, as part of the effort, SCAC certified auxiliary fuel tanks for the corporate version to extend the airliner’s range to 7,000 km. It also introduced the SSJ100 B100 version, which features increased-thrust PowerJet SaM146 engines and helps the jet operate from short runways. The SSJ100 on display at Singapore Airshow is also equipped to perform steep approaches. The function was added in the interest of the European operator CityJet, which is planning to use the aircraft on flights to London City airport. SCAC says that as of late 2017, a total of 109 SSJ100s were in operation in Russia, the EU, Mexico, Kazakhstan, and Thailand. Since the type entered service in 2011, the fleet has logged over 370,000 flight hours on 240,000 flights.